ChildChild age: 4-12 years. Under 4 are free. Tour operates June 28th through September 2nd. 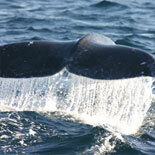 There is no better way to go Whale Watching than on the San Diego Blue Whale Watching Adventure. 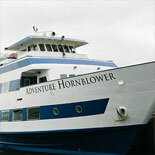 Enjoy a comfortable, large, fast and stable ride on a Hornblower yacht. Enjoy LIVE educational narration as you cruise by barking sea lions and pods of leaping dolphins as you search for the legendary blue whales. Whale Guarantee: If you don't see a whale, they will give you a pass for a Hornblower one or two hour Harbor Tour in San Diego. If you love whales, dolphins, sea lions, and sea birds, hop on board the San Diego Blue Whale Watching Adventure for a breathtaking experience on the open ocean. Speed out to sea on a large, comfortable yacht and pass barking sea lions and pods of leaping dolphins as you search for the legendary blue whales. Unmatched photo and video opportunities! As you make the 4-hour tour, you will be treated to a live narration by an experienced captain and the on-board naturalist (from the San Diego Natural History Museum). You stay cozy and comfortable with both indoor and Outdoor seating and a snack bar featuring hot food, a full bar, and souvenirs. Make your reservation today for the the San Diego Blue Whale Watching Adventure. The whale watching season is short (July and August) and is only offered on weekends (Sat & Sun) You don't want to miss this adventure! Whale Guarantee: If you don't see a whale, they will give you a pass for a Hornblower one or two hour Harbor Tour in San Diego! Sails Friday, Saturday, Sunday and Monday June 28th through September 2nd. Boarding Time: 8:45 am; Cruises 9:00 am-1:00 pm. Please allow extra travel time due to possible San Diego traffic. 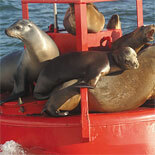 San Diego Navy Float - 970 Harbor Dr, San Diego CA 92101. When you arrive, please check in at your boarding location located at the pier. 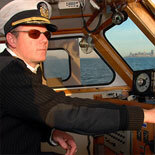 The ticket agent on duty will provide you with a boarding pass and direct you to the yacht. Reservations are required at least 2 days in advance of desired cruise. Cruises are non-refundable. With a 48-hour or better notice we will be happy to reschedule your cruise date or issue a gift certificate for the amount paid. We do not compensate for no-shows or late arrivals ~ No outside food or beverage is allowed onboard the yacht ~ River, Harbor & Whale Watching Tours: Casual attire, such as shorts and t-shirts are appropriate. We recommend bringing along a light jacket or wrap as it may get breezy on board, especially for those cruises that occur out on the open ocean.